Shelridge Saturn AWG " SATURN"
Saturn is the dog of my soul. We share the same birthday but he is 37 years my junior! He is a real mummy's boy. He is slightly big for breed showing but he is a perfect size for me. He has many nicknames but the one that suits him best is "gentle giant". Eventhough he is big but he is ever so gentle and softly. He is a sensible handsome boy with superb temperament, he loves people but he loves his mummy the best. There is no cross word in his dictionary. He is friendly and passionate. Everyone who meets him would want to take him home. Saturn was bought to do Obedience but I was hooked with Agility. 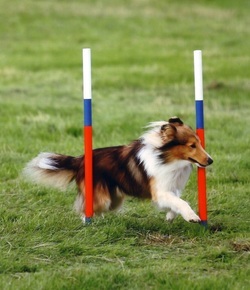 He has been in many major Agility Finals. He has competed in Crufts 2010 & 2011 in the mini/mixi pairs, pairing with a micro size sheltie Bracken (Moutland Made In Heaven), handled by Matthew Burdett. This pair's first time competing at Crufts and finishing in 4th place, what an achievement! They repeat the result again in 2011. Saturn also ran for ESSC Crufts Team in 2011 to replace Sing who suffered from injury. Saturn is a natural herder. He is a very keen herder too. He is able to work a big flock of sheep. Moving to a Farm is wonderful for him as he gets to work after he retired from Agility. He likes to keep his mind busy.